Home » ELLASVISION's booth » SOLD:100 ml 3.4 oz MOROCCAN ARGAN OIL FOR DRY AND DAMAGED HAIR FIBRE. Win with "Ella-Vision" Introduction Welcome to "Ella-Vision" sales from Israel. I'm dealing with all kind of high quality Judaica (Only originals from "Pninat-hakesf", "Art Judaica", "Vazarov", "Karshi International", "Amy Souvenirs Ltd.", etc. ), I'm the cheapest and quickest provider of unique, high quality Judaica, IDF and other Israel-related items all over the world and now as well. I'm sending all items in recycles packaging. Item Description I'm offering a I'm offering a 100 ml 3.4 oz MOROCCAN ARGAN OIL FOR DRY AND DAMAGED HAIR FIBER. 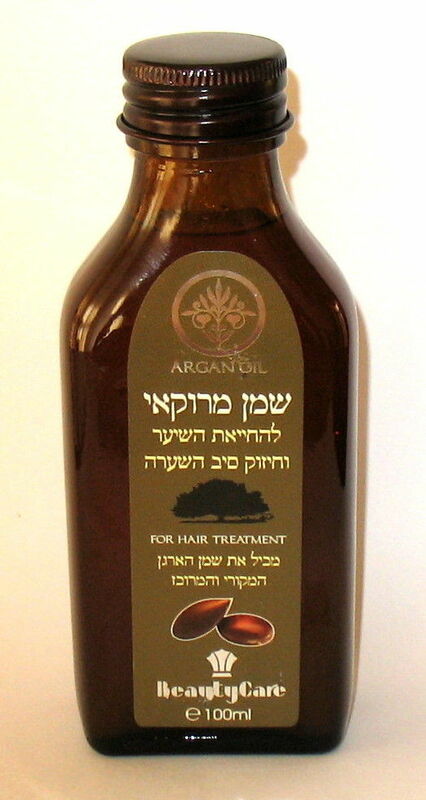 Thanks to the unique composition of Argan nut oil rich in omega-6 and vitamin E oil revives dry and damaged hair, strengthens the hair fiber and leaves the hair shiny and healthy. Note: This is not a serum! Direction of use: Shake before using. Apply on the hair from the root toward the end. Shipping Terms All items are coming from Israel and it can take up to 4 weeks to arrive. Import duties, taxes and charges are not included in the item price or shipping charges. These charges are the buyer's responsibility. Please check with your countries customs office to determine what these additional costs will be prior to bidding/buying. Bidder can combine any number of items for shipping cost reduction! Please contact me for details! Payment Terms Winner can pay only via PayPal. Please send your payment within 7 days after receiving invoice. Please ask all questions before bidding. After the end of the auction the sales prices are final and are not negotiable. Feedback policy I will leave feedback after it has been left for me.